Cadcorp SIS Desktop is a family of GIS desktop products developed by our partner Cadcorp. The product is used for all phases of spatial data handling: preparation, creation, configuration and management, viewing, querying, editing, analysis and modelling. All Cadcorp SIS Desktop products use the Microsoft®Office Fluent™ user interface (the ‘Ribbon’). This means that working with Cadcorp SIS Desktop is a very similar user experience to that of using various Microsoft® Office products that use the same interface technology. Maps can be navigated by panning and zooming. The behaviour of map overlays is controlled by setting them to be either editable, hittable, visible, invisible, or as a basemap. Spatial and database queries are supported and commands are available to measure both newly-created and pre-existing map items. Cadcorp SIS Desktop products use Windows® printer drivers and maps can be printed in exactly the same manner as any other document created by Windows-based software. It is possible to create new map items such as points, line strings, and polygons, and determine their graphic representation. 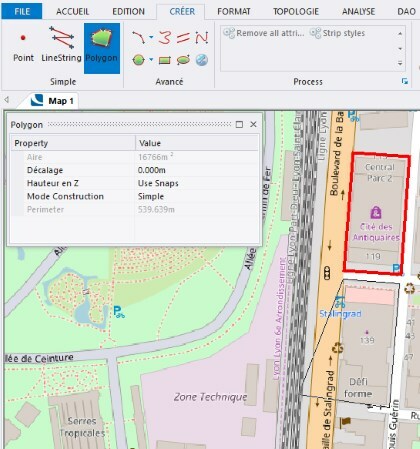 It is also possible to create cartographic output in the form of thematic maps, in which map items are styled or labelled according their properties or attribute values. Both raster and vector maps can be viewed in 3D as images draped over terrain. Cadcorp SIS Desktop products support advanced GIS data buffering operations, Thiessen polygon analysis, grid analysis, contour mapping, flow-line generation and hotspot mapping using Kernel Density Estimation (KDE). Terrain modelling capabilities include the ability to create triangulated irregular networks (TINs), digital terrain models (DTMs) and relief shading. 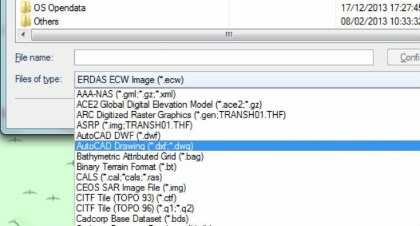 Cadcorp SIS Desktop products offer a number of tools for managing both individual map overlays, and their grouping into Projects. Advanced geometric editing tools are included. Capabilities include item snapping, creation of off sets, line generalisation, trimming and rotating. Users can create link, node, chain and polygon topologies, both by construction and by conversion. It is also possible to create line strings and polygons by the automatic tracing of an existing map item. Tools are also provided to identify and clean up corrupt topology. Cadcorp SIS Desktop maintains the integrity of attribute data by validating attribute values against attribute type, at the point of attribute data entry. Systems administrators have access to diagnostic tools regarding software performance. Cadcorp SIS Desktop products are supported on the following Microsoft Windows operating systems, in both 32-bit and 64-bit versions: Microsoft Windows Vista®, Microsoft Windows 7, Microsoft Windows 8, and Microsoft Windows 10. Over 160 GIS, CAD, web and database formats can be read directly and without the need for translation. 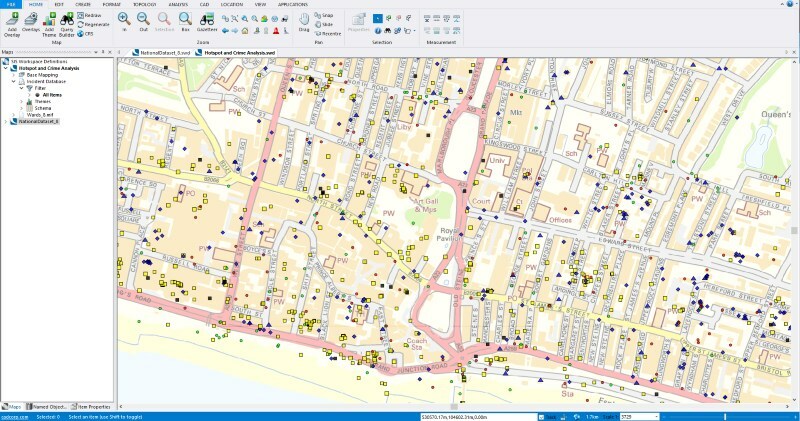 Supported formats include ESRI™ Shape, ESRI Personal Geodatabases, MapInfo® TAB and MIF/MID, Open Geospatial Consortium (OGC®) GML, WFS, WCS, WMTS, KML), AutoCAD® DXF™/DWG™, MicroStation®DGN, OS MasterMap®, ECW, Oracle®, Microsoft SQL Server®, and PostGIS. Data can be exported in over 45 formats. Cadcorp SIS Desktop users can take advantage of a number of productivity tools for automating and customising their workflows. It is possible to define and save Processing operations describing repetitive sequences of tasks. For automation tasks that require even greater flexibility, users and developers have access to Python™, the high-level programming language. All commercial Cadcorp products provide access to the Cadcorp SIS API. This allows the developer granular control over all aspects of their mapping data and interfaces and is used to build routines, extend functionality, and customise interfaces and workflows.